Faith Abiodun is an entrepreneur, project manager, writer and speaker. He combines a hybrid background of journalism, education, corporate communications, non-profit management and youth development advocacy in his work of building lasting institutions for change. His undying passion for youth development led him to establish The F.A.I.T.H. Initiative (TFI), a non-profit youth and community development organization in Nigeria in November 2008, with a mission to “build a socially and economically prosperous Nigeria through investments in leadership, entrepreneurship and education”. 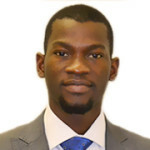 He is presently employed at African Leadership Academy (ALA), South Africa as Communications Associate and Director of the International Relations Council. Faith Abiodun earned a Bachelor’s Degree in Geography from the University of Ibadan, Nigeria, and a Master’s degree in Public Administration (MPA) at Syracuse University, USA. He is a Global Youth Ambassador for A World at School and member of the American Society for Public Administration.